Swimming with the whale sharks is a unique and wonderful experience. that it will remain for a long time in our memory, the whale shark is completely harmless for people, in turn, is a very docile, curious, and peaceful creature that swims very slowly on the surface, and is not frightened when divers or swimmers, approaching him which makes it easy and relaxing to swim with them. The whale shark (Rhincodon typus) is the biggest fish that exists on the planet, can reach up to 18 meters long!, the little information that has been generated so far, is that the longevity of the whale sharks reached 100 years, we can find these beautiful creatures in the seas and oceans of warm waters near the tropics. Among the countries that are home to sharks, whales are Australia, New Zealand, Honduras, Philippines, Mexico, and Tanzania. They live near coasts and river mouths. 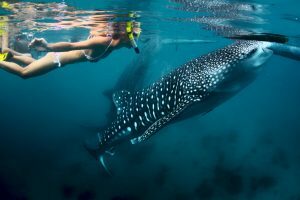 In La Paz, starting from September-October until and March-April, you have the chance for some best whale shark snorkeling in the world. Yes there are some places where there might be more animals, but the bay of La Paz is big and at the same time small enough to find this incredible animals with almost a 100% guarantee. 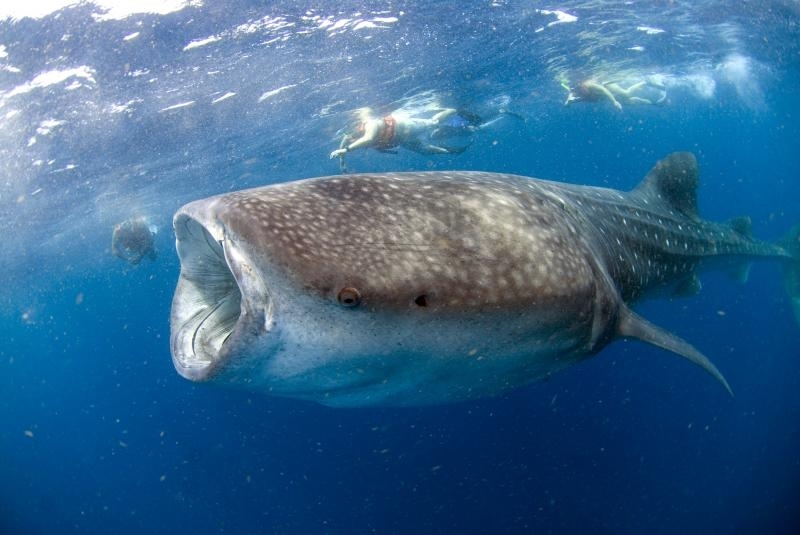 Cabo Trek in collaboration with Whale Shark Research Project organizes educational Whale Shark snorkeling: our tour begins with a 20 to 30 minute briefing with explanations about the sharks and about safety during the activity. This introduction takes the whole experience to another level, Darren and Manuel 2 of the marine biologist on board will be more than happy to share all the information and experience they made in many years working with the Whale Sharks. The boat ride lasts around 3 hours and if you take in account the 2,5 hours travel time from Cabo San Lucas the hours of light of the day are almost consumed. But not without a “Coffe Break” at the Hotel California on our way back! Beautiful day trip for families and small groups with the usual quality Cabo Trek service.